The servo drive system comprises the basic SINAMICS V90 servo converter and SIMOTICS S-1FL6 servomotor. The system features eight converter frame sizes and seven motor shaft heights to cover a performance range from 0.05 kW to 7.0 kW for operation in single-phase and three-phase networks. Can be simply integrated via PTI, PROFINET, USS, Modbus RTU. The SINAMICS V90 servo drive system enables a wide range of simple Motion Control tasks to be implemented cost-efficiently and conveniently with the focus being on dynamic motion and processing. For single-axis drives, the line infeed and the power supply of the motor are combined in one device – the Power Module. For single-axis applications, the closed-loop drive control is handled by a special Control Unit (e.g. CU310-2) mounted on the Power Module; for multi-axis applications, using a Control Unit (e.g. CU 320-2) coupled via DRIVE-CLiQ. In the latter case, instead of the Control Unit, a CU adapter is mounted on the Power Module. 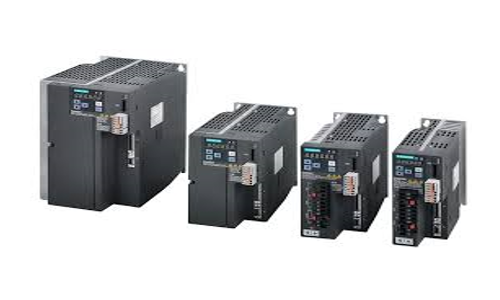 AC-Drives are each equipped with a CU310-2 Control Unit for coupling to a higher-level control. It offers functions from a basic speed controller up to extensive positioning functions. CU310-2 DP with PROFIBUS DP connection or CU310-2 PN with integrated PROFINET interface are available. The drive is connected to a multi-axis Control Unit, e.g. CU320-2, using the CU adapter CUA31 via the DRIVE-CLiQ interface. This Control Unit then handles the drive functions for the AC-Drive. In this configuration, SINAMICS S120 AC-Drives can also be used in mixed operation with SINAMICS S120 multi-axis devices. This facilitates maximum flexibility when using SINAMICS S120 devices. In comparison to the CUA31, the CUA32 also has an integrated HTL/TTL encoder interface to connect an external encoder.